Questions for Littles: What does Eve name the son in Genesis 4:25? Why? By what name were men called in Genesis 4:26? In whose likeness was Adam made (Genesis 5:1)? In whose likeness was Seth begotten (Genesis 5:3)? What happened to nearly all of the men in chapter 5? What did Enoch do after he begot Methuselah (Genesis 5:22)? What happened to him instead of dying (Genesis 5:24)? What did Noah’s dad hope that he would bring (Genesis 5:29)? In the Scripture for tomorrow’s sermon, we see that the Lord did in fact appoint another seed in the place of Abel. In fact, it is with the establishing of Seth’s line that men begin to be called by the name of Yahweh (more literal reading of Genesis 4:26). This is exactly the point of Luke, by the Holy Spirit, in Luke 3:38. Adam was in the likeness of God, and Seth is in the likeness of Adam, and the way Genesis 5:3 speaks of Seth implies that this is something that is distinguishing him from Cain. Indeed, this is a line of gospel hope. Eve expresses it by the name Seth (“appointed”). Seth’s family expresses it once Enosh is born, calling by the name of the Lord. Enoch expresses it, once Methuselah is born, his entire life being a walking with God at that point. Even “good” Lamech expresses it, naming his son Noah (“rest”), as he looks for the reversing of the effects of the fall. Yet, despite all of this gospel hope, there is one great problem in chapter 5: they all keep dying. Eight times, we see that frightful conclusion, “and he died.” Did the hope of everyone but Enoch end up perishing? Of course not. But this does set us up to expect something about the promised serpent-Crusher: He is going to have to do something about death! And He has. We can think comfortably, now, about our bodies turning to dust. We go into the ground mortal and corruptible, and we will come back out of that ground incorruptible and immortal, like Christ’s own resurrection body. In HIM is fulfilled the hope of the gospel! How are you a son of Adam? Are you also a son of God? How—in whom? Questions for Littles: Who saw the blind man in John 9:1? What did the disciples ask (John 9:2)? What was Jesus’s answer (John 9:3)? How did Jesus heal him (John 9:6-7, John 9:11)? What day was it (John 9:14)? What do some of the Pharisees decide that Jesus has done wrong (John 9:14-16)? What do others say? Whom do the Jews refuse to believe at first? What do his parents say, and why (John 9:20-23)? What does the whole group seem to have concluded about Jesus by John 9:24? What does the former blind man know? What does he think is marvelous? What do they say about him and do to him, despite Jesus’s testimony about the reason for the man’s blindness? In the Gospel reading this week, Jesus cures one man’s blindness, and exposes a host of others’. It’s a sad irony. In the opening verses, Jesus directly testifies that the man being born blind was not because of a particular sin, but only for the glory of God in Jesus’s works. But then, at the end of today’s portion, the Pharisees condemn the man as being “completely born in sins” and put him out of the synagogue. The Pharisees are blind about this man. And of course, they are blind about Jesus, whom they call a sinner as well. The only ones that they think are good are themselves. Blind again! “Are you teaching us?” they ask. You see the implication: we aren’t sinners; we’re the ones who notice that everyone else is. I suppose that if there’s a man who was an expert on the plight of those born blind, it would have been this man. After all, he had a vested interest in knowing whether that had ever been healed. But he says, “since the world began, it has been unheard of that anyone opened the eyes of one who was born blind.” It is no wonder that Jesus calls Himself the light of the world. This was the work that He had come to do: to show that He had brought the salvation of God, and to accomplish the salvation of God. And indeed, there is nothing that could be more appropriate for a Sabbath! One thing that often goes unnoticed in this passage is Jesus’s statement that there is a time coming when the miraculous sign-works that He is performing will no longer be done. “Night is coming when no one can work.” He is the light of the world, and any sign-works that are done are revelations of Him—that He is from God. As He says elsewhere: even if they didn’t believe the words, they should still have believed on account of the works! What do you believe about Jesus? Has He opened your eyes to see your sin, or are you still blind? Has He opened your eyes to see Him, or are you still blind? When we come to the table on the coming Lord’s Day, one of the things that we will want to come having done is examine ourselves. “Am I believing in Christ as He is offered to me in the gospel?” That’s a question that we need to be asking ourselves, and indeed, it is a question that we answered publicly, when we first professed our Christian faith. One of the many blessings of our new Psalter-Hymnal is having the Athanasian Creed ready to hand. Up to this point, we have been confessing the Nicene Creed at the table. The Athanasian creed is more developed than that of Nicaea (325) and declares carefully those truths about the Trinity that we have been studying from Scripture in the Education Hour, as acknowledged by the elders who gathered at the councils of Ephesus (431) and Chalcedon (451). In the Reformation, reforming churches wished to demonstrate that they were not inventing some new religion, but still confessed the same historic, biblical faith that was once for all delivered to the saints. So, they retained and confessed such creeds as the Athanasian Creed. One problem, however, was that as a result both of Roman Catholic contentment to keep the masses (pun intended) in the dark, and the accumulation of contra-biblical Roman Catholic teachings, many in the churches had come to believe that Christ’s human soul went to Hell upon His burial, rather than being dismissed to the paradise of His Father’s hands from the cross. 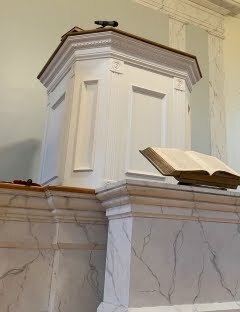 So, would the Reformed improve the language of the creed, at the cost of appearing to introduce new doctrine in order to correct this erroneous thinking? They chose instead to retain the language, and correct misconceptions by teaching. So, we are again blessed to have the Trinity Psalter Hymnal. When you read the “descent clause” in the Athanasian Creed on p854 on the Lord’s Day, you may notice a footnote referring you to Heidelberg Catechism 44 (p879), Canons of Dort 2.4 (p904), and Westminster Larger Catechism 50 (p945). Heidelberg and Dort explain the descent clause the same way that Calvin did—that the confessing of Christ’s humiliation in the “Apostles’ Creed” was not ordered by chronology but rather by intensity—that although He finished (as He Himself declared) enduring Hell upon the cross before He was buried, yet that pouring out of God’s wrath was His humiliation’s greatest extent and so it is named last. Westminster explains the descent clause historically, basically saying that this was the language used to describe not a place that He went, but His body’s spending three days in the grave under the power of death. It is vitally important that we believe these two things—that Christ suffered all of the Hell that our souls deserved by the time that He said “it is finished,” and that He indeed continued under the power of death for three days, and on the third day rose again. As we approach the table, confessing this together, let each of our hearts resoundingly say, “I believe this!” And let us show forth Christ’s death, as we feed upon Him by faith. Questions for Littles: What did Paul come to Troas to do (2 Corinthians 2:12)? Who opened that door? But how did Paul feel about it (2 Corinthians 2:13)? Why? So, then what did he do? How was God leading him all this time (2 Corinthians 2:14)? What was God spreading through him? Whom else does God lead in this way? What kind of fragrance are we unto God (2 Corinthians 2:15)? Among whom? What kind of aroma are we to those who are perishing (2 Corinthians 2:16)? And what kind of aroma to those who are being saved? From Whom have we received this task (2 Corinthians 2:17)? Before Whom do we conduct this task? To whom, and from whom, does the apostle therefore need no recommendation (2 Corinthians 3:1)? What letter of recommendation has been provided him (2 Corinthians 3:2)? By Whom (2 Corinthians 3:3)? With what, instead of ink? Upon what, instead of stone? Through whom have we come to have such a ministry (2 Corinthians 3:4)? From whom can we have what it takes for such a ministry (2 Corinthians 3:5)? What (Who!) is the key for such a ministry as this (2 Corinthians 3:6)? In this week’s Epistle reading, we find out what the victorious Christian life and ministry looks like. It looks, in part, like having a messed up church that sorrowfully hard letters at one moment, and then another letter just to remind them to forgive and to show their love at another. The victorious Christian life looks, in part, like being somewhere that you know God has opened up for you, but finding that your spirit is so restless that you just have to go elsewhere. The victorious Christian life looks , in part, like being an aroma of death to people who are perishing and knowing that your choice is either to become a “peddler of the word of God” or to come to terms with the fact that God does nothing wrong by withholding His life-giving Spirit from some who hear us. The victorious Christian life looks, in part, like having God’s miraculous work in our hearers being a letter of commendation from Him—that those who criticize us don’t care to read. “Now thanks be to God, who always leads us in triumph in Christ! How shall we enjoy this victorious procession through life? By focusing upon Him who opens the doors. Him who spreads through us the fragrance of knowing Him. Him who smells upon us the fragrance of His beloved Son. Him who makes us to “smell like” Himself. Him who makes us smell like life itself to those whom He saves through us. Him from whom we have this ministry. Him in whose sight we have this ministry. Him who allows our hearts to rejoice in what He sometimes does with us through His Spirit. Him who has given us fellowship with Christ in this ministry. Him who is our sufficiency for it! What is the key to ministry? An all-consuming focus upon Him! What service has Jesus assigned to you at this point in your life? What is the key to that ministry? By what habits in your life does He foster this all-consuming focus upon Him? Questions for Littles: Whose territory does this passage describe (Joshua 15:1)? What is their southern boundary? Where does it begin (Joshua 15:2)? What two other bodies of water mark it at the end (Joshua 15:4)? What is its east border (Joshua 15:5)? How far does that go? What land features tend to mark its northern border in Joshua 15:7-8? What topographical features in Joshua 15:9-11? What is its western border (Joshua 15:12)? In this week’s Old Testament reading, we continue through one of the thickest, most tedious-to-read sections of Joshua. With what is it so thick? With what is reading it so tedious? With the faithfulness and mercy of God! The faithfulness of God, because God is keeping His promises. In particular, in this section, Judah is the greatest of the tribes, as promised. We are preparing to hear that the scepter ends up in Judah, and that it will not be lost until Shiloh, God-with-us in the Person of Jesus, comes. But this is also a lesson in the mercy of God, because this faithfulness on God’s part is so very good and wholly undeserved. We can see the goodness in all of the provision that is implied in all of these topographical features. The Salt Sea. The Nile. The Mediterranean. The Jordan. Each of these bodies of water have something unique to offer, whether salt, fish, papyrus, commerce, irrigation, and more. Then there are the valleys—fertile places where rich soil has been deposited ever since the flood. And the mountains—more varied climates, with important wood and mineral resources, not to mention that excavating and clearing them produces natural strongholds for military purposes. So, as we simply follow the border around Judah, to the uninitiated 21st century American it sounds like a bunch of irrelevant names for tripping over or slogging down in, as we dutifully plug away through the Bible. But, if we have a good doctrine of Scripture, we know that these words are God-breathed and profitable. Paying careful attention quickly pays off. This is the tribe that Jesus comes from, and that alone is worth the cost of pushing through this passage. The King is coming! The Savior is on His way! And the immediate context piles up the riches for us. Not every location is one that we know Christ to have visited. But every location is both a reminder that He has been here for us, and a reminder that God’s mercy to His people in those locations extends two thousand years in each direction from Christ. What are the current boundaries of God’s blessing to you? How does Judah enclose another kind of blessing for you altogether? When/how do you meditate on these goodnesses from God? Questions for Littles: Who was talking to Cain? What two questions did the Lord ask Cain in Genesis 4:6? What further question did God ask Cain in Genesis 4:7? What is the assumed answer to that question? What did the LORD say lies at the door, if Cain does not do well? What did He say sin desired? What did He say that Cain should do instead? With whom did Cain speak in Genesis 4:8? Where were they in verse 8? What did Cain do? Who talked to Cain again in Genesis 4:9? What did He ask Cain? What was Cain’s first response? Was that true? Secondly, what did Cain ask the Lord? What is his implied answer to that question? What question does the Lord now ask Cain in Genesis 4:10a? What declaration does the Lord make in Genesis 4:10b? 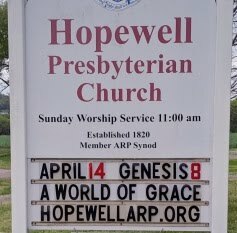 What judgment does God pronounce in Genesis 4:11? What does Genesis 4:12 say in explanation of what this curse means? What will Cain have to do, since he will no longer be able to farm successful? Now what complaint does Cain make in Genesis 4:13? What does he put at the center of his complaint in Genesis 4:14? From Whose face did he complain that he would be hidden? What ironic complaint does he make at the end of verse 14—what is he afraid that someone might do to him? What does the LORD say will happen to whomever kills Cain (Genesis 4:15)? What does the LORD do to him so that everyone will know not to kill him? What does Cain do as soon as he goes out from the presence of the LORD (Genesis 4:16-17)? How does this compare to Genesis 4:12? How many wives does Lamech take (Genesis 4:19)? What do their children accomplish (Genesis 4:20-22)? What does Lamech brag about in Genesis 4:23-24? In the Scripture for this week’s sermon, we saw first, that sin kills the sinner; second, that sin attacks God; third, that sin spurns grace, and fourth, that sin may be disguised in earthly glory. Sin kills the sinner. Cain was angry at God, but God was trying to help Cain see his true enemy: his sin. Sin desired to dominate him, and what he needed to do was destroy it. Kill it. But, he couldn’t, because he was not hoping in Christ and was not led by the Spirit. He chose the sin that was killing him over the Lord who was being merciful to him. Therefore, sin spurns grace. One of the main features of the passage was God’s mercy to Cain. The Lord warns and rebukes him. And the Lord does not immediately destroy him. And the Lord even puts a mark of protection upon him. But every good that the Lord does to him ends up testifying against him, because he does not repent. Finally, sin may be disguised in earthly glory. Cain builds the first city (in defiance of his punishment!). Lamech is a ladies’ man, who writes hymns to himself. His children are successful farmers, musicians, engineers, and beauty queens. How are you battling sin? How is God’s patience leading you to repentance?